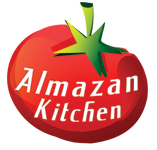 Authentic Swiss dish called “Raclette” made by AlmazanKitchen in the original way from scratch! This dish is really authentic and original because we made it from raclette cheese round made in the mountains of Turtmann, Switzerland by the masters wearing the title of “Swiss Master of Cheese”. It carries the full flavors of mountain herbs and made only of the best raw milk from the region. Fresh boiled potatoes, fried bacon and originally scrapped fresh-melted raclette cheese. Everything was made in the winter forest near the beautiful running river – what else could make this scenery way better? Share your thoughts in the comment section! Fill the bowl with water, toss in the handful of fresh potatoes (washed!). Add 1 pinch of salt and cover with lid. Cook for 40-60 min. Slice & dice 300g of Serbian bacon. Preheat the pan, grease it with oil and fry the bacon until crispy golden brown. Serve the potatoes with the bacon. Make the pike from the stick. Skewer ½ round of Raclette cheese up. Melt and scrap the cheese, serve with potatoes & bacon! Hooooch lebe AlmazanKitchen – Grüße aus Deutschland!!!! Lord have mercy upon me. It was perfect torture to not have a bite! !